"Space - the Final Frontier. These are the voyages of the Starship Enterprise, its five-year mission to explore strange new worlds, to seek out new life and new civilizations, to boldly go where no man has gone before." 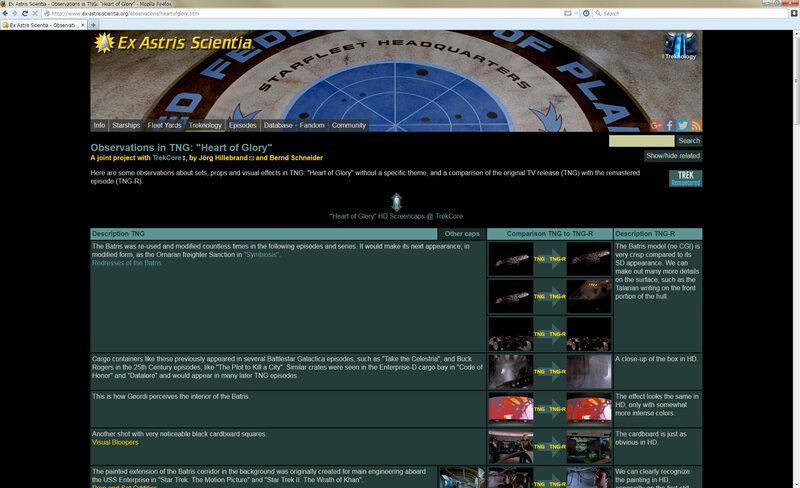 Ex Astris Scientia (EAS) is an unofficial, privately owned and strictly non-commercial website dedicated to the Star Trek science fiction franchise. It was created and is maintained by Bernd Schneider, an IC design engineer and long-time Star Trek fan based in Germany. EAS focuses on the starships and future technology that appeared in the various TV series and movies, as well as on the discussion of artistic, political, social and philosophical aspects of Star Trek. The Starship Database, Starship Articles, Fleet Charts, Treknology Encyclopedia and the treatises on Time Travel, Investigations and Observations are the most comprehensive references of their kind available anywhere. They are considered by some fans as almost authoritative, although the conclusions put forward at EAS are in no way official. EAS is canon-based, meaning that only evidence that actually appeared on screen is taken into account, as opposed to games or novels. If in any way possible, updates and amendments of the facts and conclusions at EAS take place immediately whenever newly found canon evidence requires them. Minor maintenance of the site takes place almost every day. New content is added at least twice a week. 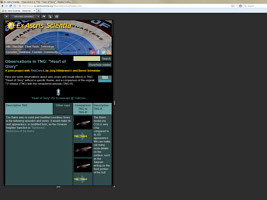 EAS includes episode reviews of all Star Trek series and movies, galleries of starships and other pictures, many of which were originally scanned or created for this site and are not available in this form elsewhere. Among the numerous smaller sections of the site the continually updated Links page with 200 hand-picked Star Trek sites is of particular interest, as well as the Ex Astris Excellentia Award (EAE), the only renowned award for Trek websites still in existence. It is given out to outstanding Trek sites in uninterrupted succession since 1999. EAS itself received a large number of distinctions too. The site was launched on January 21st, 1998, at that time located on the server of the University of Siegen at www.uni-siegen.de/~ihe/bs/startrek. Since 2000 the domain is www.ex-astris-scientia.org and has been secured until 2021. The language of EAS is English. A small number of articles are available in German. However, an EAS version in German or other translations of the site are not planned. While EAS is essentially based on static HTML, there are numerous customized or custom-made CGI and PHP scripts implementing special or interactive functions like the feed processing, random image display, Guestbook, Add Your Link, Poll, Feedback Form, Episode Review Submission Form, Substance/Particle Submission Form and the Site Search. An RSS newsfeed is available as well. A strict ethical code enforced at EAS includes a ban on scripts that are not sufficiently under the control of the EAS webmaster, such as on full social media integration with its privacy issues, as well as on any form of advertisements or sponsoring. With roughly 4000 unique visitors every day and 180 gigabytes transfer volume per month EAS is among the world's top Star Trek websites. 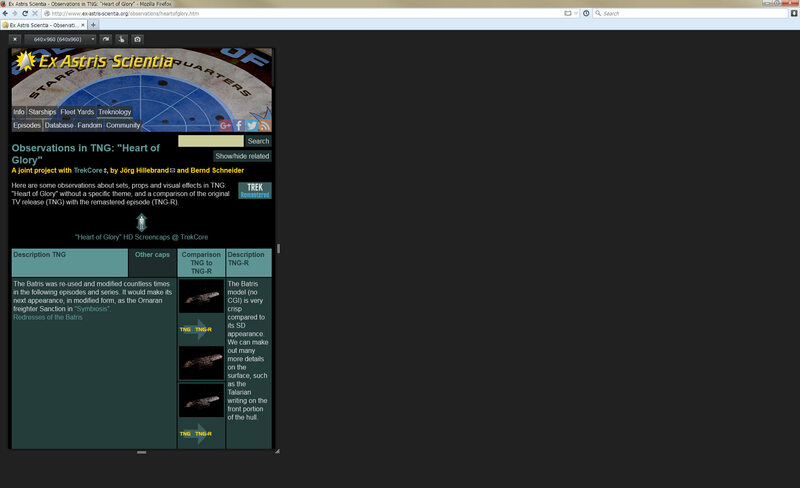 The site ranks between #3 and #7 in the Star Trek category at Alexa, only surpassed by news and community sites. EAS is the biggest and most frequented commerce-free Trek site to exist and the arguably best known Trek site maintained by a single individual. 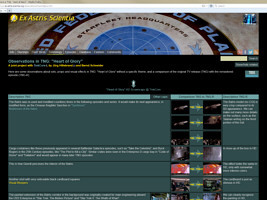 EAS spawned several fan projects that would not quite fit into the strictly canon nature of the site and were outsourced to their own websites with distinct names and layouts, namely the Advanced Starship Design Bureau (ASDB), The Starfleet Museum, the Journal of Applied Treknology (JoAT), Star Trek Fan Fiction and Canon Fodder. All these sites present the works of various artists and authors. They reside on the same server as the main site and are taken care of by Bernd Schneider. It was in 1973 when I made first contact with Star Trek: The Original Series. I was still a child and I didn't get the whole picture of what was going on in the show, but I already recognized some difference between Star Trek everything else on TV. It must have been the very special, often surrealistic atmosphere -although I would have chosen different words- and the fact that future technology was credibly presented. TOS epitomized the vision of scientific miracles and of a bright future more than any other fiction. Contrary to common belief, I don't think that the series has lost much of its credibility since. I was lucky that my father was not really interested in football (soccer), otherwise I would have faced the same dilemma that many German families had on Saturday afternoons when Star Trek aired on the second channel and the sports news on the first one. There was no chance yet for Star Trek to become really popular. Another problem, especially in Germany, was and still is that the episodes are shown exclusively in a dubbed version. Translation errors and unintentional humor included. Especially TOS was given a silly undertone that can't be found in the English version. I didn't see the Star Trek movies of the 70's and 80's in the theater, perhaps because movies generally weren't very popular and there was hardly any media coverage. The first time that I watched Star Trek again after it hadn't been repeated on TV for almost a decade was in 1988. It was also the first time that the complete series aired in Germany (save "Patterns of Force"), and I didn't miss a single episode. Yes, there were really bad ones, but even the worst episodes became pieces of the entirety, the Star Trek Universe. TNG marked a new beginning, and I loved it from the very first episode. There were not only the advances in both fictional technology and real-world VFX. TNG was special because it had both the pleasant atmosphere with carpeted floor and, on the other hand, still the daring "where no one has gone before" feel. And great stories. And Jean-Luc Picard, the best of all captains. I admit I didn't care much for DS9 in the beginning, which is mostly because the stories of the first season were so darn boring. Subsequently, as it developed and unfolded its story arcs, I became very fond of it. DS9 was the series that perfectly combined the bright and hilarious with the dark and threatening, and so were the characters: always good for a surprise. The series created new facets of Star Trek while still remaining true to the roots. The same goes for Voyager. However, unlike DS9 this series hit me like a lightning. Ask my pals Thorsten and Steffi about my facial expression when I saw the starship's engines fold upward for the first time. It was the series of "Wow!" effects, which doesn't mean that profound stories were missing. They were rather the rule than the exception. It's only that the many critics probably failed to see them behind the outstanding visual effects. Star Trek Enterprise continued where Voyager ended. Only set 200 years too early. 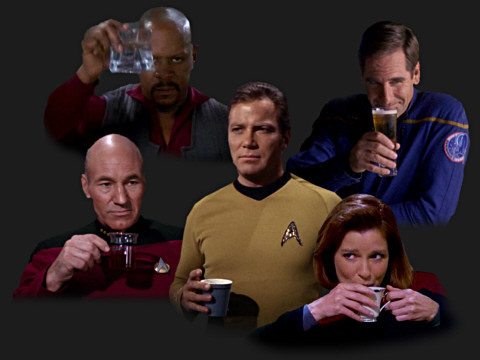 The series lived up to its premise as late as in the final season, arguably one of the best seasons of all Trek series. I enjoyed J.J. Abrams's reboot, because it brought back the excitement into the franchise. But the popcorn movies with their focus on mindless action, their gaping plot holes, their miscarried homages and their lack of a positive vision failed as prequels to the Star Trek I love. The new movies compare to the old Trek like one-night stands to a decade-long relationship. Star Trek Discovery fares even worse. The series doesn't explore strange new worlds but only reimagines the existing ones. It is shiny in design but dull in terms of the stories. Discovery throws away essential assets of the franchise, not only on the visual side, while it cherry-picks references to the old Star Trek as if fan service were the decisive quality mark. What do I like most about Star Trek (at least about the classic pre-Abrams and pre-Discovery Trek)? Well, I could give you the brief and obvious answer: starships! I certainly have more sophisticated motives as well, such as Gene Roddenberry's commonly quoted vision of a better future for humankind. While both answers are true, I usually consider the entirety, the consistency that keeps Star Trek together and that distinguishes it from other fiction. Star Trek has a philosophy that I continue to hold up despite all the recent efforts by the people in charge to break it up or water it down. All this makes up the essence of Star Trek, at least in my view. Why did I create this website? The answer may surprise, but I did it all for myself in the first place. I have always tried to sort out and categorize things, and this is my approach to Star Trek likewise. After the fun of watching comes the fun of analyzing. So this website is more or less my personal compendium of Star Trek, as far as I have the time to and feel like adding something. However, before you call me egocentric, I have done few things about this site all alone. There were many visitors who gave me feedback, be it praise or criticism, or provided me with valuable information and suggestions. I maintain regular contact with several of them, and a few of them I can even call my friends. I think this alone was worth while all the efforts putting up this site, as an incentive for discussions about our favorite (I hope so) science fiction. I originally built this site with Microsoft Frontpage on a Pentium I 100MHz with 32MB RAM and 2MB graphics board and for Netscape 3. That was in 1998, years before CSS and CMS were commonplace and a decade before social media and smartphones even existed. I have been working extremely hard to ensure the survival of this site by converting nearly everything to CSS. But achieving full W3C compatibility any time soon is neither a realistic goal nor would I waste much time on changes that concern rather the code than the look of the site. I'm all for clean code but running a huge website means I can take only a small step at a time. This website is laid out to occupy the whole screen width. 1024*768 pixels or more is the optimum screen resolution, but with a few exceptions it will look good even at as few as 800*600 pixels and on mobile devices, for which I have defined a viewport of 640 pixels width. EAS is not optimized for mobile devices though, because in order to create a mobile version or one optimized for all kinds of devices I would need to make the full transition to W3C compliance in the first place. And then there would still be the absolutely unsolvable problem of how to convert hundreds of tables with individual layouts to something totally different that fits on a mobile screen, and how to achieve that without thousands of hours of manual editing. And ultimately I would have to break apart pages or shorten articles to make them mobile-ready, something I will most definitely never do. Fortunately the display on mobile devices profits from the adaptable width concept that EAS was designed with since the very beginning, even though a few of the 100% width tables don't fit on the screen.